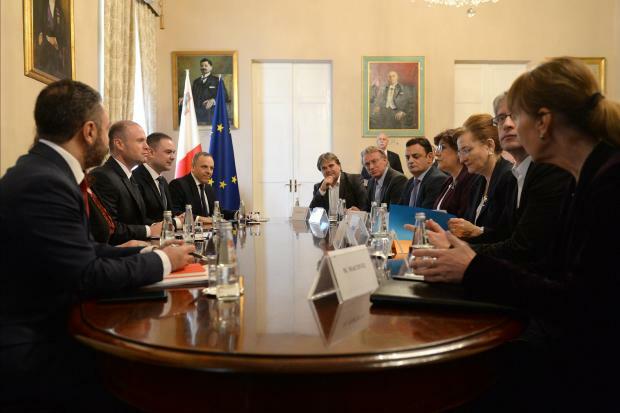 The MEPs meeting with Joseph Muscat in December. Members of the European Parliament slammed Malta's rule of law in an intense hour-long discussion within the Civil Liberties Committee on Thursday morning. 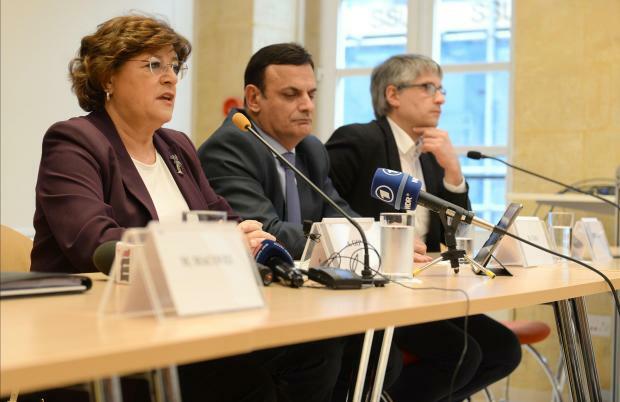 The discussion focused on a critical report prepared by a delegation headed by Socialist Ana Gomes following a visit to Malta last December. The committee also heard a brief address by Andrew Caruana Galizia, son of Daphne Caruana Galizia, who praised the committee for its work and asked it to keep up the pressure. Read how the discussion unfolded below. 10.15am: Ana Gomes says the EP had asked the owners of Pilatus Bank as well as citizenship firm Henley and Partners to be questioned by MEPs. She did not say whether they had accepted. 10.08am: The sons of Daphne Caruana Galizia say the family is fighting for its basic rights. "With each passing day, the more the evidence of who commissioned her murder will disappear. The Justice Minister, the police heading the inquiry are two people my mother investigated," Andrew Caruana Galizia says. "Our mother is dead but her work will continue through your work. Don't let anyone tell you it's none of your business. This is not about politics. We have nobody representing us in our country, at least not through the leadership of the parties. It's about European law. Malta has become a place of crime, where money is laundered. It's toxifying European politics. Malta is the backdoor in the Schenghen area. There are no background checks on those buying passports. Don't lose heart. You're filling part the shoes of my mother." 10.05am: Minister Bonnici tails off by saying that there is concensus between the prime minister and the Opposition leader that there is no serious risk of rule of law or the deterioration of European values in Malta. His parting comment is met with an unidentified MEP who says: "disrespectful and not credible". 10am: Owen Bonnici points out to The Sunday Times of Malta survey, which he says showed wide approval towards the government and the police, but low trust in the media. He chronicles the initiatives taken by the Labour government to enforce rule of law. He tells MEP Ana Gomes that she doesn't understand how the whistleblowers act operates after her comments on former FIAU official Jonathan Ferris. We are keen to engage with all MEPs and ready to answer any questions they might have on the rule of law. We want to share with them the huge number of historic reforms we did in such a short time to strengthen our democracy and what we will keep on doing. 9.58am: Justice Minister Owen Bonnici takes the floor. Says he is willing to answer any question but points out: "What you're portraying today is not the real picture of Malta". 9.55am: "The brutal killing of your mother was an attack against our freedom of speech," MEP Francis Zammit Dimech tells Caruana Galizia's sons. Daphne Caruana Galizia was killed on October 16. 9.52am: German MEP Heinz Becker urges the Maltese people to stand up against corruption saying they were well protected in the European Parliament thanks to the likes of David Casa. 9.48am: MEPs reveal they had written to the Cypriot authorities to understand the reasoning behind the arrest warrant against Maria Efimova in Cyprus. A former Pilatus Bank employee, Ms Efimova is linked to the Egrant scandal. 9.42am: MEPs agree that Daphne Caruana Galizia's sons are to be given time to speak in the chamber. 9.40am: David Casa says persons and banks involved in money laundering continue operating in Malta. The impunity is shocking. 9.38am: Greens MEP Sven Giegold is scathing in his criticism. He says he learnt from his visit to Malta that the committee was not only focusing on money laundering but a system where the culture of impunity reigns. He asks, for example, why serious questions about the gas contract and privatisation of hospitals were still not properly investigated. "Why influence voters with public contracts? We have to be serious." 9.36am: "It's regrettable that Muscat dismissed the European Parliament delegation because that means he was dismissing citizens. Malta is becoming the weak link." MEP says that the Maltese passport scheme was clearly not intended for "little old grannies from Russia". 9.32am: Law-enforcement doesn't work effectively, Malta is a breeding ground for nepotism, one MEP claims, saying that the passport scheme was especially a dangerous scheme. But one MEP says that the period of analysis was too short, and that there was no opportunity to speak to all members of civil society and the media. 9.24am: MEP Roberta Metsola starts by saying she wanted to make it clear that the "rot" that a highly-scathing report uncovered does not represent the characteristics of the majority of the people of Malta. "Malta deserves to be one where checks and balances exist more than just on paper, where the law cannot be abused to protect the crooked. Where journalists can write without being blown up." 9.21am: The word "disturbing" features prominently in the Portuguese MEP's speech as she lists the number of serious questions the Maltese government is facing. She reveals says she received a "communication" from Pilatus Bank on Wednesday night but does not have the details yet. 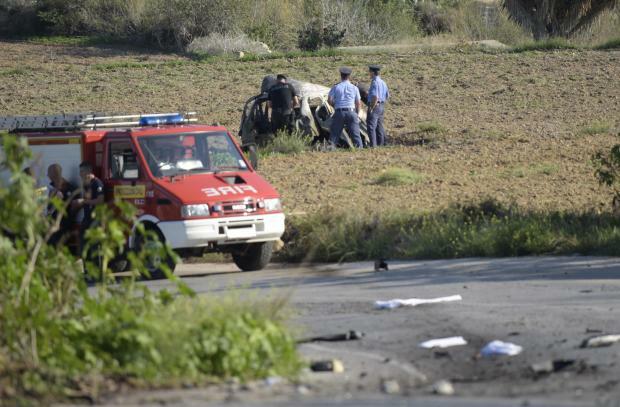 9.15am: Ana Gomes: "I hope the police will be able to clarify who ordered the killing of Daphne Caruana Galizia. Disturbing that the family of the deceased are not being kept up to date." She points out that not only did the police fail to act against former EU Commissioner John Dalli, (who resigned in the midst of the snus scandal) but he was then appointed as an advisor to the prime minister. Ana Gomes, David Casa and Sven Giegold in Malta last December. 9.12am: Ana Gomes: "What's happening in Malta concerns us all, not just in Malta. We're discussing money laundering and corruption, and even our own security." She spares no punches - says police continue refusing to take action against Konrad Mizzi and Keith Schembri. 9.10am: Daphne Caruana Galizia's sons are present in the chamber. 9.05am: The Committee on Civil Liberties, Justice and Home Affairs started at 9am. Justice Minister Owen Bonnici will take part in the debate.